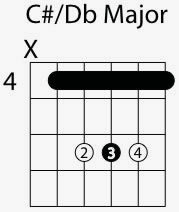 Here is a shape for the C sharp / D flat major guitar chord. This chord diagram uses one of the more common bar chord voicings. The lowest root note of this chord is the C# / Db on the 4th fret of the 5th string. When a note can be called by more than one name, in this case C sharp or D flat, that note is said to be enharmonic. This can be a difficult bar chords to play. 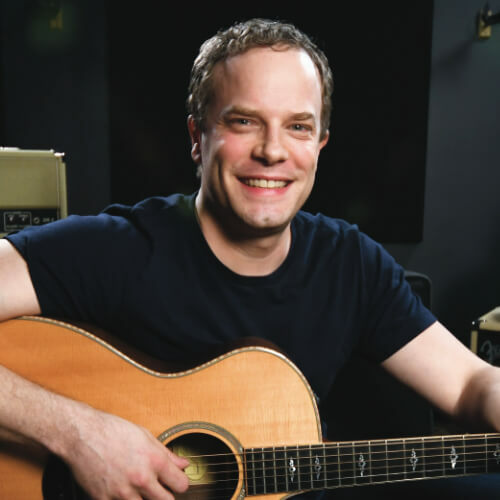 If you need more help on playing bar chords you can always go to the bar chord lesson page.